This form is a license agreement for a private box in a stadium which features National Football League (NFL) and Major League Baseball (MLB) sporting events. The Owner of the box licenses its use to the Licensee for a period of years. Furnishings and decor of the box are specified, as well as rights for tickets, parking and use of the box. This Stadium Box License Agreement (“License” or “Agreement”) is made as of _________________, by and between STADIUM BOX OWNER, a __________________ corporation (“Owner”), and STADIUM BOX LICENSEE, a _________________ corporation (“Licensee”). A. Grant of License. Subject to the terms and conditions set forth in this Agreement, Owner hereby grants Licensee the privilege and right to the use and possession as described herein of the executive suite (the "Suite") located in _________ Stadium, ______ County, _________ (the "Stadium") and identified by number in Paragraph B.
a. This License is for Suite Number ____. b. The Suite shall have the following number of Total Seats: _______ (___). c. The Suite shall have a location in relation to the playing field in the Stadium shown in attached Exhibit A. 2. Ticket Allotment. The Ticket Allotment for the Suite shall be _______ (___) season tickets for _________ home games and Zero (0) season tickets for _________ _________ home games. 3. Suite Fee. (See Paragraph E). a. Annual Suite Fee: _________ dollars ($________). b. Initial Payment due: Upon receipt of signed agreement. 4. Term. _______ (___) years (See Paragraph F). 5. Security Deposit: Waived (See Paragraph G). No additional Security Deposit is required if this Agreement is a renewal of an existing License Agreement. C. Furnishings, Decor and Alteration of Suite; Suite Services. Schedule 1 to this Agreement governs the manner in which the Suite shall be furnished and equipped and sets forth services to be provided to the Suite. D. Possession and Use, Tickets and Parking. Schedule 2 to this Agreement governs Licensee's right of use and access, rights with respect to tickets and rights with respect to parking. E. Payments. Section 3.1 of Schedule 3 of this Agreement governs the payment of the annual Suite Fee. F. Term. Section 3.2 of Schedule 3 to this Agreement governs the term of this Agreement and Licensee's right of first refusal. This Agreement shall become effective and binding when executed by both Licensee and Owner. G. Security Deposit. Section 3.3 of Schedule 3 of this Agreement governs the payment of the Security Deposit. H. Other Terms and Conditions. Schedule 4 to this Agreement sets forth other Terms and Conditions applicable to this Agreement. I. Special Stipulations. Schedule 5, if Schedule 5 is attached hereto, contains any modifications of this Agreement or additional agreements between the parties. J. Entire Agreement. This Agreement, consisting of this basic Agreement and Schedules 1, 2, 3, 4 and (if attached) Schedule 5, constitutes the entire Agreement between the parties. This Agreement supersedes all prior agreements or negotiations concerning the subject matter hereof. No representation, promise or undertaking heretofore or concurrently made, whether in advertising or marketing materials, discussions or otherwise, shall be binding on either party unless specifically set forth herein. Each person or persons listed above as Licensee must sign this Agreement. If the Licensee is a corporation or a partnership, the title of the authorized signatory must be included. a. The following fixtures, furnishings and equipment: upholstered chair seats facing the playing field; carpeted floor; wall coverings; built-in cabinetry (including lockable liquor cabinet); sink with running cold water; ice-maker; counter-size refrigerator, color television; lounge-seats and table; and such other furnishings as Owner shall provide. h. Such other special services as Owner, in its sole discretion, may offer at prevailing rates and terms established from time to time by Owner. 1.2 Licensee shall not make any additions or alterations in the interior or exterior of the Suite or the fixtures, furnishings and equipment therein, without the prior written consent of Owner. However, Licensee may supply articles of appointment, such as pictures, plants or insignia reasonable in size and in good taste, as determined solely by Owner. Any such additions, or alterations permitted by Owner shall be made at Licensee's expense and be made free of any liens or encumbrances, in a good workmanlike manner, and in compliance with all applicable permits, authorizations, building and zoning laws, ordinances, orders, rules, regulations and requirements of all governmental authorities having appropriate jurisdiction. Any fixtures or materials incorporated in or attached to the Suite by Licensee shall become the property of Owner unless Licensee shall have obtained the written approval of Owner to remove same prior to the expiration of the term of this Agreement, and if so removed, Licensee shall, at its own expense, repair and restore the Suite to its condition as of the commencement of this Agreement. Licensee shall be entitled to the use and possession of the Suite during the term of this Agreement, except as provided in Section 2.2 below, and subject to the provisions of this Agreement. Licensee and Licensee's guests shall be entitled to use the Suite only at times for which appropriate tickets for admission to the Suite have been obtained and the Stadium is intended to be open for use by the general public. Licensee and Licensee's guests shall be bound by and shall observe the terms and conditions upon which tickets for admission to the Stadium have been issued by the sponsor or promoter of such event including, without limitation, the policy with respect to the cancellation or postponement of the game or event. Access to the Suites shall be from the club level of the Stadium through a private door to the Suites. Access to the club level shall be shared only by persons holding appropriate tickets for admission to the Suites and to the club level seats. Each Suite shall be provided with a lock system. 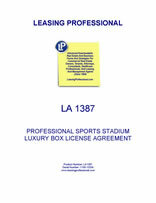 This Agreement provides Licensee only with the right and privilege to possess and use the Suite in the manner set forth herein, and except as pertains to the special right and privilege to so possess and use the Suite, this Agreement does not confer upon Licensee or Licensee's guests any greater or lesser rights and privileges with respect to admission to the Stadium than afforded to other holders of tickets for admission thereto. a) Stadium Licensees. During the term of this Agreement, Stadium Licensee shall receive the number of admission tickets to the Stadium set forth in Paragraph B above for access to the Suite for each pre-season and regular season football game played by the _________ at the Stadium and each regular season baseball game played by the _________ _________ at the Stadium. Additionally, Owner shall make available and Stadium Licensee shall be free to purchase (i) up to ____ (___) direct access tickets for admission to the Suite for all pre-season and regular season _________ games, and (ii) up to ____ (___) direct access tickets for admission to the Suite for all regular season _________ _________ games. Stadium Licensee shall also have the opportunity to purchase the required admission tickets to the Stadium for access to the Suite for any other games or events at the Stadium, including but not limited to post-season football games of the _________, post-season baseball games of the _________ _________, Major League Baseball All-Star Games, college bowl games, or concerts (collectively, "Special Events"), for which Stadium Licensee desires to use the Suite. Admission tickets for such other games or events shall be priced by the sponsor or promoter of the game or event, but in no event shall the admission price charged to Stadium Licensees and their guests exceed the admission price charged for an admission ticket to the highest priced category of seats in the Stadium. If after Owner offers tickets for purchase for Special Events at the Stadium, Stadium Licensee determines not to purchase any of such tickets for the Suite within the time specified, then, at the option of Owner, the use of the Suite for such Special Event shall revert to Owner and Owner shall be free to sell the use of the Suite for such Special Event to a third party. In the event Stadium Licensee purchases some, but not all of the admission tickets to the Suite for a Special Event, Owner may make available for purchase by others, including executive suite licensees who have been relocated or otherwise denied access to their respective suites, any unpurchased admission tickets for seats in and access to the Suite. In the event the Suite is deemed by the promoter of any event, concert or game hosted in the Stadium to have obstructed or non-manifest seats, Stadium Licensee shall not have the right to purchase admission tickets to the Suite. However, Owner in its sole discretion, may offer alternative seating in the Stadium to Stadium Licensee on terms and in locations to be determined by Owner. Notwithstanding any other provision herein to the contrary, it is understood and agreed that the availability of the upper tier of Suites (i.e., Suites No. ____ et seq., collectively, the "____ Level Suites") during any Super Bowl Games held in the Stadium will be subject to the requirements of the National Football League. Accordingly, Stadium Licensees of ____ Level Suites may be required either to relinquish use and possession of their Suite for any Super Bowl Game held in the Stadium or to share possession of their Suite with others who have been required to do so. A Stadium Licensee of a ____ Level Suite shall be entitled to purchase admission tickets to the Super Bowl Game for at least fifty percent (50%) of the seats in their respective suites. Owner shall make reasonable effort (but can make no guaranty) to place Stadium Licensees of ____ Level Suites and their guests in comparable suites as closely together as circumstances will permit. Stadium Licensees of Suites located in the lower tier of Suites (i.e., Suite No. ____ et seq., collectively, the "____ Level Suites") shall be entitled to exclusive use and possession of their respective suites during any Super Bowl Game held in the Stadium and shall be entitled to purchase admission tickets for each seat in and access to their respective suites; provided, however, that any seat for which any admission ticket has not been purchased within the time specified by Owner in advance of the Super Bowl Game may be made available by Owner to others, including Stadium Licensees of ____ Level Suites who have been required to relinquish possession of their Suite, as aforesaid, to accommodate requirements of the National Football League.